Please note that the slobber straps are no longer available with the logo as shown. As an alternative you can have them left plain, or have metal conchos of stars, horseshoes or a running horse. Please note that if choosing the running horse the nearside slobber strap will have the horse facing the rider and the offside facing away. Quality 10ft rope reins made from 13mm diameter doublebraid yachting rope with leather strips backspliced into each end. This rope is ideal for reins. Very strong yet lovely and soft in the hands. 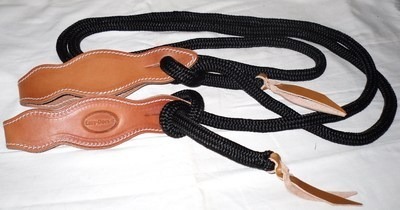 The slobber straps are in a quality leather which has been oiled and then stitched. The stitching is not only decorative but stops the leather stretching. Each slobber strap has a generous measurement of 17 1/2 inches (almost 9 inches when doubled), with a measurement of 2 1/4 inches at the widest point. If you prefer tassel ends to the reins then just let me know when ordering.